Septic tank installation should only be attempted by a professional. An improperly installed septic tank could mean catastrophe for both your property and your pocketbook. Not only that, but if you fail to gain the proper permits beforehand, you could be in violation of local ordinances. Here are some important steps that you must take before any ground is broken on your septic tank project. First of all, you will need to decide which material you want your septic tank to be made out of. You can choose a septic tank made of either plastic or concrete. 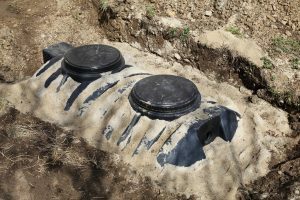 Septic tank installation is easier with a plastic tank because it is lighter and easier to handle, but concrete septic tanks are more common. Next, you will need to determine the size of the septic tank that you require, based upon the number of people in your household. A home inspector or someone at your local municipal office will be able to help you determine the size of septic tank you need. You will then need to locate a spot on your property not only for the septic tank but for the field bed that will filter the waste water. The requirements as to the size of the field bed, the distance from the house, etc. are very specific. You will need a home inspector to help you determine exactly the right spot on your property for septic tank installation. You will require building and construction permits from your municipal office before you undertake any sort of home construction project on your property, and this includes installation of your septic tank. Failing to acquire the proper permits will incur citations by municipal authorities. Installing a septic tank requires the involvement of professionals every step of the way. An amateur installation will most likely result in a costly redo sooner or later, often precipitated by a plumbing disaster.